English Heritage has a long tradition of producing highly illustrated archaeological monographs about key sites and topics of importance to the understanding of the historic environment in England. Many of the past titles have long been out of print and yet are still of value for reference purposes. As a service to the wider archaeological community, English Heritage is now making these titles available as ebooks (see the English Heritage Publishing catalogue for details) and as PDFs which can be accessed here for free. The PDFs are, in the main, scans of the original publications and reproduce the pages of those publications. While we have tried to ensure that the pages are legible, file size limitations may mean that some pages are less clear and, in case of doubt, users should consult the original publication. We have included scans of large foldout illustrations, but not the contents of any microfiche that was in the original volumes. A Saxon Bed Burial on Swallowcliffe Down: Excavations by F de M Vatcher. English Heritage. Acton Court: The evolution of an early Tudor courtier's house. English Heritage. An Archaeology of Town Commons in England 'A very fair field indeed'. English Heritage. Ancient Monuments in the Countryside: An archaeological management review. English Heritage. Balksbury Camp Hampshire Excavations: 1973 and 1981. English Heritage. Battle Abbey: The Eastern Range and the Excavations of 1978-80. English Heritage. Beeston Castle, Cheshire: Excavations by Laurence Keen & Peter Hough, 1968-85. English Heritage. Birdoswald: Excavations of a Roman fort on Hadrian's Wall and its successor settlements, 1987-1992. English Heritage. Bodmin Moor An archaeological survey Volume 1: The human landscape to c 1800. English Heritage. Bodmin Moor An archaeological survey Volume 2: The industrial and post-medieval landscapes. English Heritage. Bowhill: The archaeological study of a building under repair in Exeter, Devon, 1977-95. English Heritage. Boxgrove: A Middle Pleistocene hominid site at Eartham Quarry, Boxgrove, West Sussex. English Heritage. Brean Down: Excavations 1983-1987. English Heritage. Cadbury Castle Somerset: The later prehistoric and early historic archaeology. English Heritage. Carlisle Castle: survey and documentary history. English Heritage. Corbridge: Excavations of the Roman fort and town, 1947-80. English Heritage. Dangerous Energy: The archaeology of gunpowder and military explosives manufacture. English Heritage. Dover: Buckland Anglo-Saxon Cemetery. English Heritage. England's Coastal Heritage: A survey for English Heritage and the RCHME. English Heritage. English Prisons: An Architectural History. English Heritage. Etton: Excavations at a Neolithic causewayed enclosure near Maxey Cambridgeshire, 1982-7. English Heritage. Excavation of the Iron Age, Roman and Medieval settlement at Gorhambury, St Albans. English Heritage. Excavations at Medieval Cripplegate, London: Archaeology after the Blitz, 1946-68. English Heritage. Excavations at Mucking: Volume 1: The site atlas. English Heritage. Excavations at Mucking: Volume 2: The Anglo-Saxon settlement. English Heritage. Excavations at Roman Corbridge: The Hoard. English Heritage. Fenland Survey: An essay in landscape and persistence. English Heritage. Furness Iron: The physical remains of the iron industry and related woodland industries of Furness and Southern Lakeland. English Heritage. Goltho: The development of an early medieval manor c 850-1150 . English Heritage. Grimes Graves, Norfolk Volume I: Excavations 1971-72. English Heritage. Grimes Graves, Norfolk Volume II: Excavations 1971-72, The Flint Assemblage. English Heritage. Gussage All Saints: An Iron Age Settlement in Dorset. English Heritage. Hadrian's Wall Bridges. English Heritage. Hadrian's Wall: Archaeological research by English Heritage 1976-2000. English Heritage. Hambledon Hill, Dorset, England: Excavation and survey of a Neolithic Monument Complex and its Surrounding Landscape. English Heritage. Hazleton North: The excavation of a Neolithic long cairn of the Cotswold-Severn group. English Heritage. Henry VIII's Coastal Artillery Fort at Camber Castle, Rye, East Sussex. English Heritage. Hillforts: Prehistoric Strongholds of Northumberland National Park. English Heritage. Housesteads Roman Fort - the Grandest Station: Excavation and survey at Housesteads, 1954-95. English Heritage. Iron Age Cemeteries in East Yorkshire. English Heritage. Maiden Castle: Excavations and field survey 1985-6. English Heritage. Mapping Ancient Landscapes in Northamptonshire. English Heritage. Mawgan Porth: A settlement of the late Saxon period on the north Cornish coast: Excavations 1949-52, 1954 and 1974. English Heritage. Measured and Drawn: Techniques and practice for the metric survey of historic buildings. English Heritage. Metric Survey Specifications for Cultural Heritage. English Heritage. Planning for the Past Volume 1: a review of the archaeological assessment procedures in England 1982-91. English Heritage. Prehistoric Land Divisions on Salisbury Plain: The work of the Wessex Linear Ditches Project. English Heritage. Radiocarbon Dates from samples funded by English Heritage and dated before 1981. English Heritage. Radiocarbon Dates from samples funded by English Heritage under the Aggregates Levy Sustainability Fund 2002-4. English Heritage. Radiocarbon Dates from samples funded by English Heritage under the Aggregates Levy Sustainability Fund 2004-7. English Heritage. Raunds Furnells: The Anglo-Saxon church and churchyard. English Heritage. Region and Place: A study of English rural settlement. English Heritage. Rescue Excavation 1938 to 1972. English Heritage. Ships of the Port of London: First to eleventh centuries AD. English Heritage. Ships of the Port of London: Twelfth to seventeenth centuries AD. English Heritage. St. Bride's Church London: Archaeological research 1952-60 and 1992-5. English Heritage. Stonehenge in its Landscape: Twentieth-century excavations. English Heritage. Suffolk's Defended Shore: Coastal Fortifications from the Air. English Heritage. The Archaeology of Stone: A report for English Heritage. English Heritage. The Baths Basilica Wroxeter Excavations: 1966-90. English Heritage. The Creation of Monuments: Neolithic Causewayed Enclosures in the British Isles. English Heritage. The Dover Bronze Age Boat. English Heritage. The Field Archaeology of Exmoor. English Heritage. The Field Archaeology of the Salisbury Plain Training Area. English Heritage. The Flag Fen Basin: Archaeology and environment of a Fenland landscape. English Heritage. The Historic Landscape of the Quantock Hills. English Heritage. The Legionary Fortress at Wroxeter: Excavations by Graham Webster, 1955-85. English Heritage. The Malvern Hills: An ancient landscape. English Heritage. The Neolithic Flint Mines of England. English Heritage. The Raunds Area Project Volume 1: A Neolithic and Bronze Age Landscape in Northamptonshire. English Heritage. The Raunds Area Project Volume 2: A Neolithic and Bronze Age Landscape in Northamptonshire . English Heritage. The Roman Baths and Macellum at Wroxeter Excavations 1955-85. English Heritage. The Roman Fort of Vindolanda at Chesterholm, Northumberland. English Heritage. The Rows of Chester: The Chester Rows research project. English Heritage. The Stonehenge Environs Project. English Heritage. The Uley Shrines: Excavation of a ritual complex on West Hill, Uley, Gloucestershire 1977-9. English Heritage. The Wessex Hillforts Project: Extensive Survey of Hillfort Interiors in Central Southern England. English Heritage. Verulamium: The King Harry Lane site. English Heritage. Wearmouth and Jarrow Monastic Sites Volume 1. English Heritage. Wearmouth and Jarrow Monastic Sites Volume 2. English Heritage. 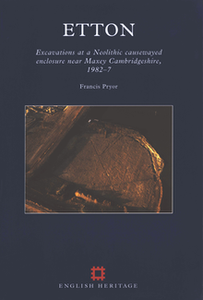 Wells Cathedral: Excavations and structural studies, 1978-93, Volumes 1 and 2. English Heritage. Wilsford Shaft: Excavations 1960-62. English Heritage. Yeavering: An Anglo-British centre of early Northumbria. English Heritage. York Minster: An architectural history c 1220-1500. English Heritage.